ST. LOUIS, Missouri, April 13, 2012 (ENS) – Missouri’s two major league baseball teams have scored solar energy projects. Both the St. Louis Cardinals and the Kansas City Royals have installed solar panels that were up and generating power when the 2012 season opened. The fans will see the new solar arrays today when the Cardinals and the Royals each host their first games of the 2012 season. At the Cardinals’ home ballpark, Busch Stadium in St. Louis, the defending World Series champion Cardinals and St. Louis-based Microgrid Energy have installed 106 solar panels on the roofs of the concession area and ticket building in the Ford Family Plaza. The solar array at the stadium’s northeast corner will produce up to 32,000 kWh of energy each year. The Cardinals will celebrate Solar Day on April 29 when they play the Milwaukee Brewers. At Kauffman Stadium in Kansas City, the Royals have partnered with the local electric utility, Kansas City Power & Light, to install a solar array capable of producing 36,000 kWh of energy each year. The largest in-stadium solar array in the major leagues, 120 solar panels are mounted on the roof of Kauffman Stadium’s Outfield Experience canopy facing south. A kiosk has been placed in the Outfield Experience to inform fans about the benefits of solar energy. Fans can learn how to monitor the production of solar energy and how solar energy benefits Kauffman Stadium and the greater Kansas City region. Caisley says the solar array could generate enough energy to power refrigeration for all the beverages in the stadium. “So your beer is going to be cooled by the sun,” he smiled. 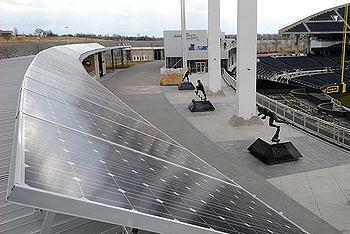 The solar array installation marks the first step in a long-term commitment between the Royals and KCP&L to maximize renewable energy resources at the ballpark, the venue for the 2012 All Star Game. The partnership ties into the renewable energy initiatives of Major League Baseball, which will be highlighted during the 2012 MLB All-Star Game and festivities in Kansas City this summer. Five other stadiums have installed solar panels, including the San Francisco Giants’ AT&T Park, Colorado Rockies’ Coors Field, Arizona Diamondbacks’ Chase Field, Boston Red Sox’ Fenway Park and the Cleveland Indians’ Progressive Field. At Progressive Field this season, an unusual wind turbine is generating electricity alongside the solar array, the first wind turbine to be installed by a Major League Baseball team. 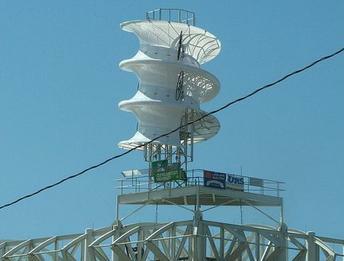 The wind-deflecting structure with small-scale turbines can generate power at low wind speeds. This innovative design is better for urban areas and confined spaces than a long-bladed wind turbine. It is rated at 25,000 kWh, and generates enough electricity to power two typical homes for a year. Development of the wind turbine was funded through grants from the U.S. Department of Energy.